Improve safety and guest experience with smart communications for hotels & casinos. Regroup Mass Notification complements your security and safety plan by enabling instant alerts to staff, teams, external contractors, and even guests. Our platform allows you to harness real-time, 2-way communication that is encrypted and reliable, making your response to critical events and daily business needs faster and more effective. To improve safety and guest security, Regroup can be used to alert specific teams of suspicious activity, theft, security breaches, and more. Our AlertManager mobile app puts the power of our platform in your hands wherever you are and makes alerting quick and efficient with two-tap sending. Regroup also improves your daily guest experience. Fill gaps in staffing quickly and enable team members to communicate quickly regarding housekeeping, building maintenance, and other guest needs to impress and delight them each day of their visit. Communicate as much as you need, because Regroup offers unlimited text, voice, email, and social media messaging. Organize your staff by department, shift, hierarchy, and more to communicate to the right people every time & empower everyone. Take Regroup with you and send alerts from anywhere with our free AlertManager mobile app for iOS and Android devices. 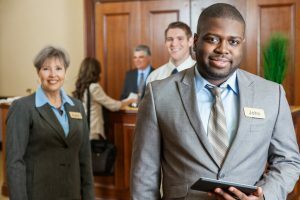 Coordinate with staff and security teams to share important information and surpass guest service expectations. Ready to see what Regroup can do for your hotel or casino? Book a 30-minute demo today!